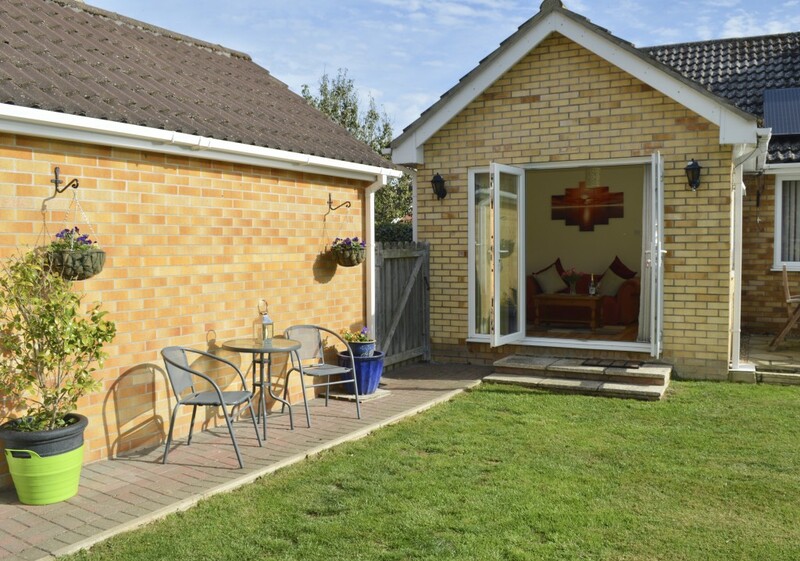 The Nest is the perfect holiday cottage in Mundesley for two people. It is a private apartment to the owners, Ray and Barbara’s, immaculate home. They are looking to welcome guests to The Nest and will be on hand if you need them and if you don’t, they will respect your privacy. The Nest is comfortable with everything you will need for a relaxing break. Mundesley is a bit of a secret jewel in the Norfolk coast. A perfect sandy beach and a vibrant village centre, including a post office, butchers, greengrocers , hairdressers and several different places to eat, drink and be entertained. There is access to the beach without having to walk into the village, via steps or a slope down the cliff, just short walk away. Buses run regularly from the main road so you can park your car and just relax! A special little place to unwind and relax. Beautifully presented with thoughtful extras. Access is down the driveway through a private gate to the rear of the owner’s bungalow. French patio doors to the sitting room. Sitting room – a pretty sunny and comfortable room with TV, coffee table and sofa bed (can be used if two single beds are required, but please ask for extra bedding on booking) side table and lamps. Kitchen – well equipped with gas oven and hob, microwave, fridge and freezer. Plenty of pots and pans etc to cook a meal if you decide to. En- suite shower room – Corner shower cubicle with mains fed shower, WC and basin. Outside – There is an area to the rear for sitting outside with a view of the garden. There is outside furniture with a table and chairs to enjoy the sunny spot, and it really is a sun trap! A perfect place to enjoy a glass of wine after a days exploring the coast. If you are looking for a peaceful holiday cottage in Mundesley this just might be the one! Mundesley is one of those pretty seaside villages that really has got everything, without the commercialism. A super place to make memories. There are many places to eat, drink and be entertained. The Ship public house has amazing views from their contemporary restaurant, or for a more traditional meal, including a wonderful Sunday carvery try the Manor Hotel, again with incredible sea views from the restaurant. There is a challenging local golf course which is friendly and welcomes players. If that’s not your thing you can always try the Pirates Adventure Golf! Fish and Chips and traditional seaside fare are served on the sea front and there is a pretty well kept Victorian Garden on the cliff top. a nice place to sit and watch the sea. There are shops for provisions a short walk away, and there are takeaways close by. The beach is beautiful and long and sandy. It has the coveted Blue Flag status and lifeguards in the summer. There are traditional beach huts along the promenade. Mundesley is a few miles from the other well know seaside towns of Cromer, Sheringham and Overstrand. During the winter months The Nest would provide a wonderful base for wildlife watching, including visiting the huge seal colony at Horsey and the numerous RSPB reserves along the coast.